Federici Dental proudly provides general and restorative dentistry services to patients of all ages in the Manahawkin, Stafford Township, Barnegat Township and Long Beach Island. Whether you’re looking for basic teeth cleanings and fillings, or are interested interested in dental implants, we can meet all your dental needs in one convenient location. In the past, there were two main options available for replacing missing teeth: dentures or bridges. But today, people with missing teeth can fill gaps in their smiles with dental implants. This is a tooth replacement option that provides long lasting results while helping preserve the jaw bone that naturally deteriorates when a tooth is missing. 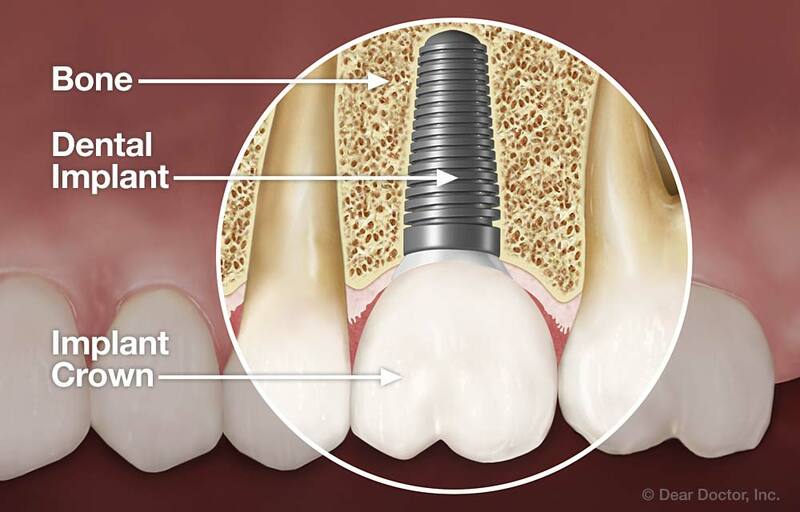 A dental implant is a small screw-like post made of titanium that can be placed in the jawbone, serving as a stand-in for the missing tooth's root. Once the implant has been placed in the jawbone and the healing process has occurred, an artificial tooth top or crown is placed on top of the post to complete the procedure. 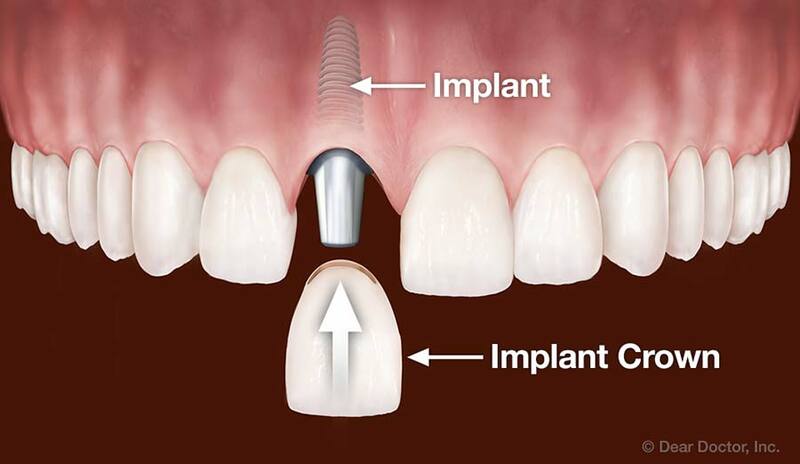 When compared to other tooth replacement options, dental implants are highly successful. The success rate for dental implants is over 95%. Implants look, feel and function just like natural teeth. Nearby teeth do not have to be involved with the placement process. Implants can last for many years and even decades with good care. Implants help prevent deterioration of the jawbone. They can drastically improve one’s appearance for more confidence and self-esteem. Implants don't need to be removed and cleaned like dentures. Dr. Joe or Dr. Dave will determine whether dental implants are right for you. They’ll also happily answer all questions and concerns about the procedure. Replace One Tooth (Single Tooth Replacement)— When you have one tooth missing, a single implant is inserted into the bone to replace the root part of that tooth; a crown then goes on top to simulate an actual tooth. This treatment choice has the highest success rate, making it the best long-term investment for replacing a single missing tooth. Even if the initial cost is slightly higher than other options, it is the most cost-effective solution over time. An implant will never decay or need root canal treatment, and feels just like the tooth that was there. 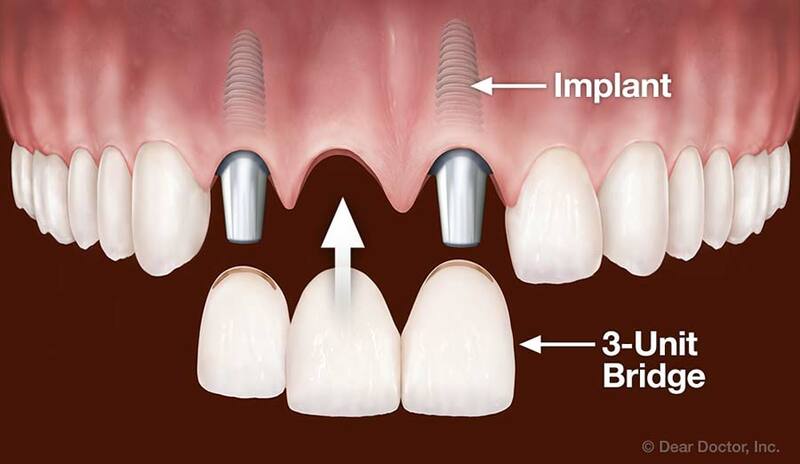 Replace Multiple Teeth (Multiple Tooth Replacement) — Several missing teeth can be replaced with multiple implants. It is unnecessary to have one implant placed for each missing tooth as implants can be used to provide support to fixed bridges. For example, a three-unit bridge to replace three teeth in a row can be comprised of two implants with a crown that spans between and has no implant in the middle. Replace All Teeth — Dental implants can be used to support an entire arch of upper or lower replacement teeth that are fixed into the mouth and never removed. If the jawbone is healthy enough, just 4 implants are needed for support the crown, otherwise 5 or 6 implants are needed. 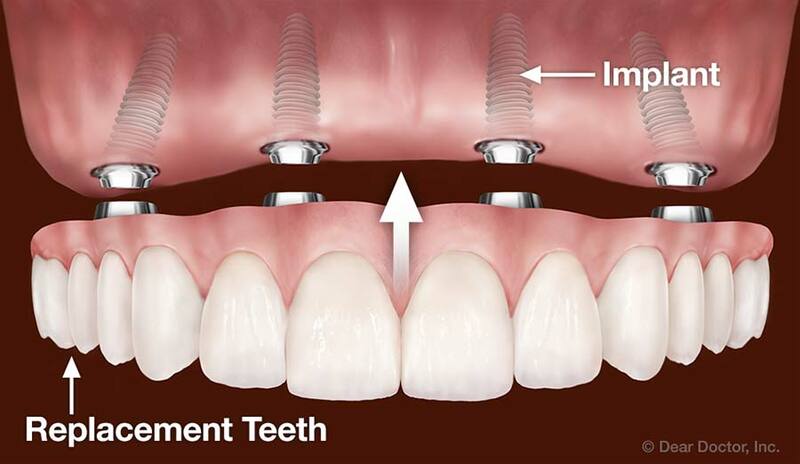 Dental implant replacement teeth protect your jawbone, won't slip, and should last a lifetime. 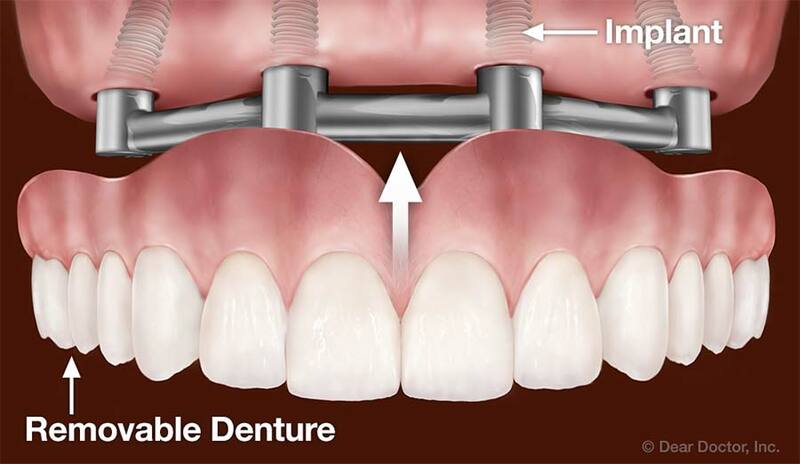 Support Removable Dentures — A removable denture can have implants attached it to make the denture more secure, comfortable and effective. An implant-supported removable denture won’t slip out of place when eating or speaking. This type of denture also assists in preserving the underlying bone by relieving some pressure that comes from biting and chewing food. Hybrid Dentures — If you have a lot of bone loss in your jaw, and would like a new set of permanent teeth, then hybrid dentures offer a great solution. Federici Dental offers fixed, screw-retained hybrid dentures that combines the advantages of a fixed replacement and removable denture. This always for a more natural, comfortable, and appealing look for the patient, while providing a stable replacement for teeth. Caring for dental implants is the same as what’s required to take good care of your natural teeth. Simply brush and floss daily and visit your Manahawkin dentist regularly for routine checkups and cleanings. Some people with dental implants develop peri-implantitis, an infection of the tissues surrounding the implant most often caused by inadequate cleaning and the buildup of dental plaque. This is why maintaining good oral hygiene and regular dental visits are so important. Excessive biting forces that result from a tooth clenching or grinding habit can lead to dental implants loosening from the bone. A solution to this problem is to wear a special mouthguard at night to protect the implants from these excessive biting forces. If you’re missing one or more of your natural teeth and would like to replace those teeth with dental implants, we encourage you to schedule an appointment with us today. Call our Manahawkin office at (609) 597-1234 to speak to one of our friendly staff members. We look forward to seeing you soon and helping you achieve the healthy and attractive smile you deserve!